“Sandakan” is derived from Suluk word “sanda” which means to pawn and “kan” is the suffix. So “Sandakan” means the place to be pawned. But who pawned it, and to whom, remains a mystery. Sandakan is Sabah’s second largest city and is located in the east cost of Borneo Island. It was the former capital of the British North Borneo during the British colonial time. In the early years, Sandakan served as a major port for early settlers to Sabah, mostly Chinese from Canton. With different nationalities of early settlers and traders, Sandakan was rich with early traces of foreign cultures. Sandakan is the second most important port, after Kota Kinabalu. The port is important for palm oil, tobacco, cocoa, coffee and sago exports. It is also one of the most bustling towns in East Malaysia. It is famous as a gateway for eco-tourism destinations in Sabah. We arrived at Sandakan by flight in the afternoon from Kota Kinabalu on 03/12 and spent two days exploring in and around the city. We left for home nearly midnight on 05/12. The places we visited are:- Sepilok Orangutan Sanctuary, Labuk Bay Proboscis Monkey Sanctuary, Gomantong Caves, Cruising along Kinabatangan River, Puu Gih Jih Chinese Temple, St Michael and All Angels Cathedral. Besides sightseeing, we also enjoyed seafood in and around Sandakan, like restaurants in Sim Sim Floating Village and seafood “Bak Kut Teh” in Tanah Merah, the first I had ever experienced in my life! In Sandakan we hired an aircon taxi with an English speaking driver (Ahmad) to take us around for two days. Sepilok Orangutan Sanctuary is the largest orangutan sanctuary in the world, covering an area of more than 4,500 hectares. The sanctuary started in 1964 for the rehabilitation of orphaned baby orangutans from logging-sites, plantations and illegal hunting. After rehabilitation, they are returned to the wilds. But many return because of availability of food during feeding times at 10am and 3pm. When we were at the Sanctuary there was only one female orangutan with her new born baby coming to the feeding platform to feed herself with fruits to her heart’s content. The sanctuary is located at the center of the mangrove forest along the coastal land near Kampung Samawang in Labuk Bay, Sandakan. 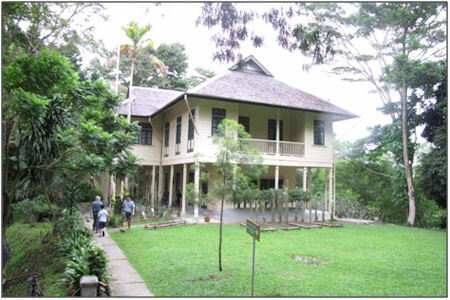 The privately-owned sanctuary is sited within an oil palm plantation. Proboscis monkeys are also known as the “Dutch Monkey” and they are only found in Borneo. They are a totally protected animal as their population has shrunk drastically due to the destruction of their habitats by human activities. Proboscis monkeys have large prominent noses, reddish flat-top hairstyles, white tails and markings. They have large, extended bellies, giving them the appearance of being permanently pregnant. 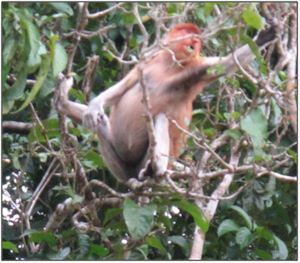 Proboscis monkeys live in groups each has one dominant male and one to eight females and their offspring. They do not fare well in captivity; they become depressed, stop eating and soon die. 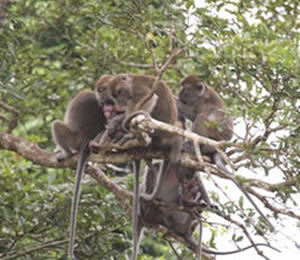 The male leaders of the pack are usually found on the highest part of the tree. Gomantong Caves are located inside Gomantong Hill, which is the largest limestone outcrop in the lower Kinabatangan area. The main cave system is divided into two parts; the more accessible Simud Hitam (Black Cave) and Simud Putih (White Cave). For centuries, the caves have been renowned for their valuable swiftlet nests. Twice a year, from February to April and July to September, locals with licenses climb to the roof of the caves, using ropes and bamboo poles to collect the nests. We went only to the Simud Hitam which is more accessible of the two caves. Its ceiling can reach 90m high. The muddy Kinabatangan River is Sabah’s longest river and is about 560km long. Logging and clearing for plantations have devastated the river and is the main cause of river water pollution. The Lower Kinabatangan is reported to have the largest concentration of wildlife in Malaysia. There are different species of hornbills, colorful birds, crocodiles, monitor lizards, wild pigs, pygmy elephants and several species of monkeys. However, it looks like the success rate of animal spotting is largely dependent on luck as we only saw some species of monkeys, hornbills up in the sky and a few birds. As we would be visiting the Puu Jih Shih Buddhist Temple on the hilltop of Tanah Merah in the afternoon, we went to a fishing village hereby for lunch and also tried to purchase some frozen fish and prawns to take home. We took the opportunity to walk around the village before we went to a restaurant to have seafood “Bah Kut Tek”. 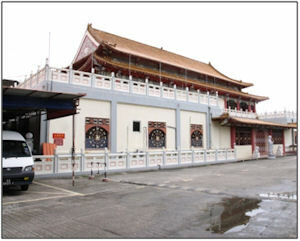 Puu Jih Shih Temple is situated on the hilltop of Tanah Merah. 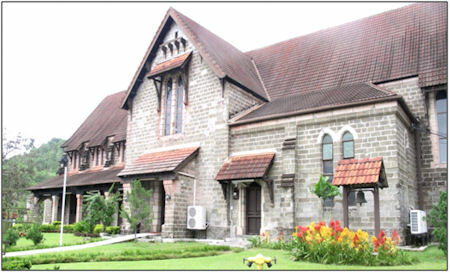 The temple was built in 1987. 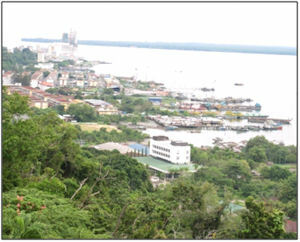 From here, one can catch a breathtaking view of Sandakan Bay. The house is situated on a hill at Jalan Istana overlooking Sandakan Bay. It was the home of Conservator of Forests, Harry Keith and his American wife, Agnes Keith, a writer, from the 1930s to 1942. The two-storey wooden bungalow, built on the ridge overlooking the town, was destroyed during WW2 but was reconstructed when the Keiths returned in 1946. Agnes had published a few books. The first is “Land Below the Wind”, a book on life in pre-war Sandakan. Her second book “Three Came Home” is about their war experiences and was made into a movie. 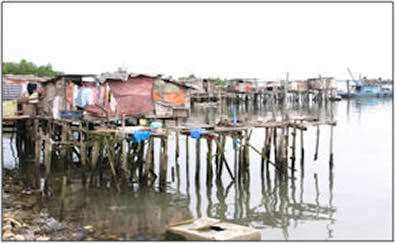 Kampung Buli Sim Sim is a water village on stilts on the coast of Sandakan. 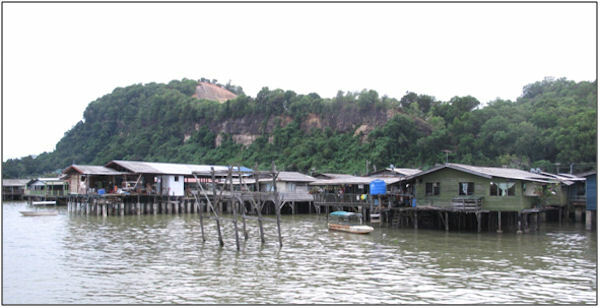 This is also the site of the original town of Sandakan which began in 1879. 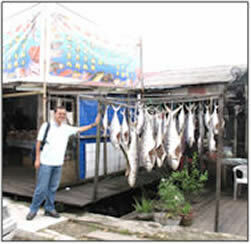 There are a few seafood restaurants located in Buli Sim Sim water village reachable by plank walkways. One of which was initially a fish market which was later expanded to include a floating seafood restaurant. Locals flock here to purchase fresh seafood once the fishermen dock at the jetty as they are cheaper than in the city’s wet market. They can also purchase from the selection of seafood available and request the chef to cook it their way. This place has become a popular destination for both locals and tourists alike as they can also get to enjoy a variety of specialty fish dishes.